Eco-Tours are all managed by local specialists, members of the scientific community and avid promoters of Armenia's natural world. These are special tours, not anything like the structured travel normally associated with group eco-tours, and they provide few of the amenities expected in other locales. These are fairly rustic, adventurous expeditions that explore the more remote areas of the country. They can be taken for adventure only (paragliding, climbing, hiking, water sports, camping, horse-back riding), or to assist in species observations (birding, flower atching, tracking endangered species). Note: those listed below are considered reputable people, and they strive to be as eco-friendly as possible, but you will not find any eco-tour provider or guide to be able to comply to standards set by western eco associations. This is not for trying, it is for lack of funding. In a country still struggling to fed its people, ecology often takes the back door. If you take an eco tour with one of these groups, you are supporting continued work to help Armenia's ecology, if only by supporting the individuals so that they can afford to stay in Armenia and work. At the very first, check with ARMENIAN ECOTOUR, 32/22 Shinararneri st., 375038 Yerevan, Armenia Tel: (3741) 397 552 Fax: (3741) 151 795 E-mail: info@ecotourismarmenia.com, zhanna@freenet.am. The association is made up of members from all the ecologically based groups and operators in the country, and will point you to the best availbale. The site is an excellent introduction to the natural beauty in Armenia. - Bird-Watching: Zoological Institute (Tel (3741) 151-413, 28-15-02, Contact: Luba or Levon, both speak English), just completed publishing "The Birds of Armenia, a Field Guide", and are the experts on guided excursions for Bird-Watchers. Considering two-thirds of the birds inhabiting Europe live or migrate through Armenia (almost half of all in the CIS), the opportunites are enormous. -Union of Mountain Sports (Tel (3741) 53-49-61, 35-27-02, 39-75-52, Contact: Shahen or Zhanna), provide expert guided all-inclusive Adventure Tours: Mountain Climbing, Sevan Sports (Sailing, Surfing, Skiing, Scuba Diving), Horseback Riding, Camping, Hiking tours of some of the most spectacular scenery in the country--if its nature, adventure and reasonable prices you want, these are the folks. 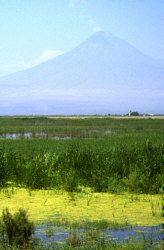 They also spearheaded Armenia's first ECOTOURISM Association. Honest, reliable folks. - The Armenian Speleological Society ( Tel (3741) 58-22-54, 62-02-48, Contact: Smbad Davtian), can arrange expert guided hikes, spelunking and mountain expeditions. Nature excursions can be arranged for 1 day to a month in length, from easy hiking to the most rugged terrain. These are the experts who mapped the country. Want to go inside of a volcano and swim in a lake? Crest the summits? These are your guys. Have all the equipment (including tents for overnight camping), provide Soviet-Jeep transportation and food. - Avarayr ( Tel (3741) 56-36-81, fax: (374-2) 151-934), 1, Pavstos Biusand St., Yerevan 375010, also arranges hiking and climbing tours along with their excursions for the tender-footed. A young, ambitious company that talks no bull, this agency was chosen by the Swiss Institute for Technology in Zurich to arrange their in-country study of Medieval Armenian architectural monuments. Expert guides, real historical information, and pleasant people. -Paragliding (Tel (3741) 56-26-01, Contact: Vartan) FAA licensed paragliders, glider and light aircraft pilots offer stunning views of the country from above. Excursions include training and paragliding trips in the most exotic locations in the country. They even arrange for horseback return trips to the summit! - Botanical Tours (Tel (3741) 56-86-90, Contact: Shahen) The Botanical Institute can arrange field trips to observe Flora and Fauna. They also take you into Nature Preserves (officially off-limits) and to some of the most pristine wilderness areas in the country. With 3,500 species within a 4 hours drive of Yerevan, and camping/rustic lodge trips to the most hidden areas of the country, this is Armenia you can't imagine.